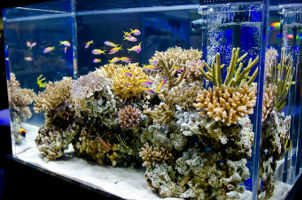 Health Benefits of Fish Tanks - Living Art Aquatics, Inc.
Can Fish Tanks Really Affect Someone's Mood? At some point we have all felt the calming effects of having our sights locked on a beautiful seascape. Without realizing it, we may have been experiencing astonishing improvements in our health. Being in the presence of an aquarium positively impacts our health far beyond the obvious calming relief. Moreover, higher volumes of exotic seascape inhabitants transmit a more valuable increase in health for its observers. Studies has proven the calming effect of fish tanks time and time again. Even that as little as 5 minutes spent observing an aquarium, viewers with agitated tendencies became calm and even pleasant. “Aquarium Therapy” is a treatment all on its own. custom fish tanks placed in waiting rooms have to have an astonishing effect on patients and family members, considering that they may be going through a traumatic experience. A study published in the journal Environment and Behavior dove a little deeper into the theory of Aquarium Therapy. An experiment suggests that spending time observing the natural habitat of these underwater creatures will not only bring about a calm effect but also lower blood pressure and heart rate. Having a higher volume of inhabitants specifically of exotic nature, accompanied by longer viewing times has proven to have a longer lasting effect on overall health and mood. For a closer look on how exotic fish tanks have been proven to help people, a study done by the Purdue University researchers has discovered the benefits on Alzheimer’s patients. After tracking 60 Alzheimer’s patients, they found that those who were exposed to seascapes were much more alert, relaxed and had much healthier eating habits than other patients. It was found that by placing an aquarium in a nursing home, it could reduce health-care costs by lowering the need for medications and supplements. Aquariums have proven to be a major health benefit time and time again. They are perfect for nursing homes and waiting rooms of both patients and distraught family members, not to mention preschools and classrooms full of hyper-active children. Imagine a world where everyone was calm and proactive. Imagine what you could get done at work with an exotic aquarium to get lost in when you needed a little inspirational boost. Here at Living Art Aquatics we have made it our mission to design all types of beautiful and striking aqua seascapes for any and every situation. We custom build all of our tanks to fit your individual need and style. With an experienced team of contractors and designers, we can even build a custom cabinetry unit to blend in with its surroundings. Give Living Art Aquatics, Inc. a call today!